The decor style of a room is defined by a number of things—the colors, the patterns, the era and style of the accessories, and more. But the room itself is mostly defined by the furniture that we choose to put in it. Sofas, coffee tables, and love seats make a living room, beds make a bedroom, and dining furniture makes a dining room. More often than not dining room furniture will consist of a table, chairs, and a buffet or sideboard. Depending on the size of the room there can be more pieces, but very rarely is there less. Buying the right dining room furniture is a big part of getting the look that you want and the functionality that you need. And a big part of your dining room set is going to be getting the right buffet or sideboard. Buffets and sideboards (the two terms are used interchangeably at times because they’re the same thing) are available in a huge variety of styles. From French country to classic Georgian, to urban contemporary, no matter what your style you’ll be able to find a piece to suit. Just be sure to get something that will fulfill your needs, whether it’s a particular style, a certain amount of storage, or some other criteria. A sideboard or buffet that consists of open shelving is airier and has a lighter feeling than a heavy, closed piece, but should you choose to use one keep in mind that you’ll have to keep the things stored on the shelves looking nice. Given that people’s formal china and linens are often very nice, this isn’t necessarily a tough thing to do, but keep it in mind when shopping. If you’re having a tough time deciding between the two you might want to consider a piece with glass doors. They’re not as visually heavy as solid doors, and they still cover some of the items inside, so you get the best of both worlds. 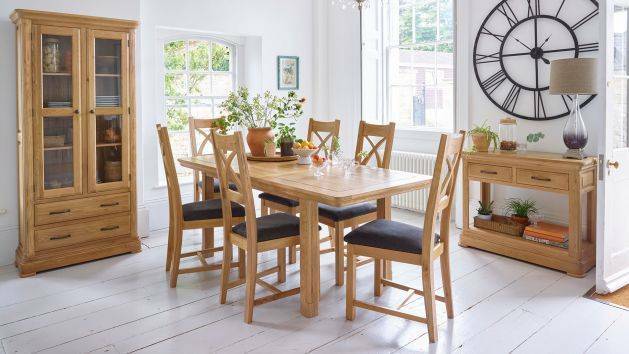 Dining room furniture is often available in sets, and if you choose to purchase one, you won’t have to worry about the sizes not relating to each other. However, if you prefer a more eclectic look, you’ll want to be sure that the pieces work together in scale, if not in style. When purchasing a sideboard or buffet remember that it should be a bit higher than the dining room table. The most common height is 36 inches. Widths and depths of dining room buffets will vary, but make sure that it balances with everything else in the room. A huge table accompanied by a small buffet will look a bit disjointed, as will a small table with a very large buffet. The most important thing to do when choosing dining room furniture, whether it’s a sideboard or something else is to make sure that it’s functional for your household and serves your needs.